Hamburger Helper in the Instant Pot!?!? 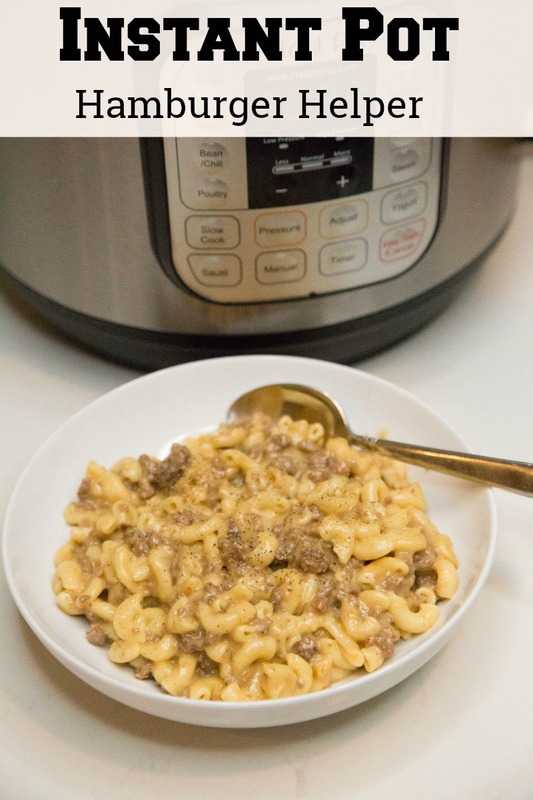 This is a meaty-spin on the Instant Pot Macaroni and was inspired by one of our MyFreezEasy members. 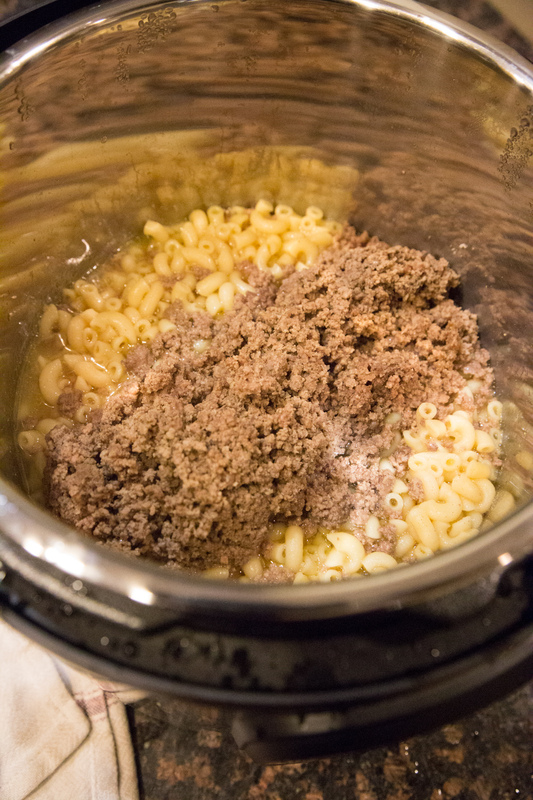 With this macaroni made in the instant pot, you just add some ground beef and whatever spices you want to get in there too! 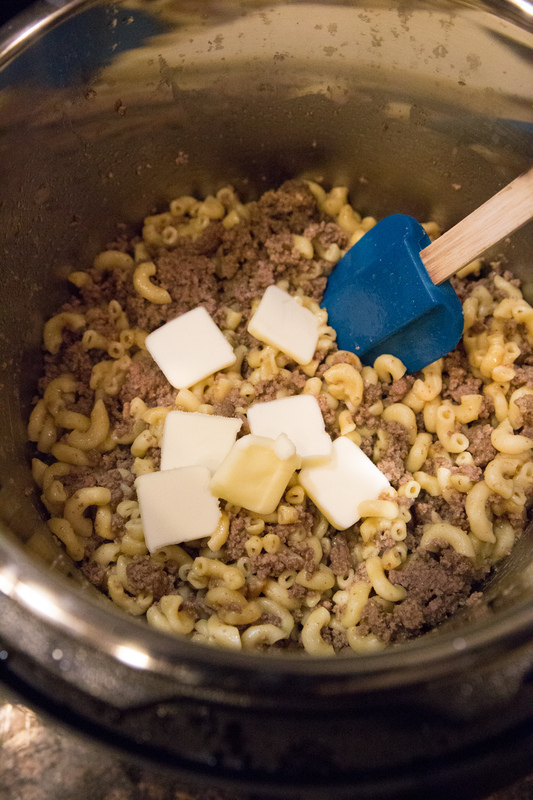 There are 3 ways to get the ground beef mixed in with the macaroni, and I will briefly explain them below. Brown the ground beef on Saute mode in the Instant Pot, drain off excess fat. Add dry pasta and liquid. Pressure cook, then mix in cheese and milk, etc. 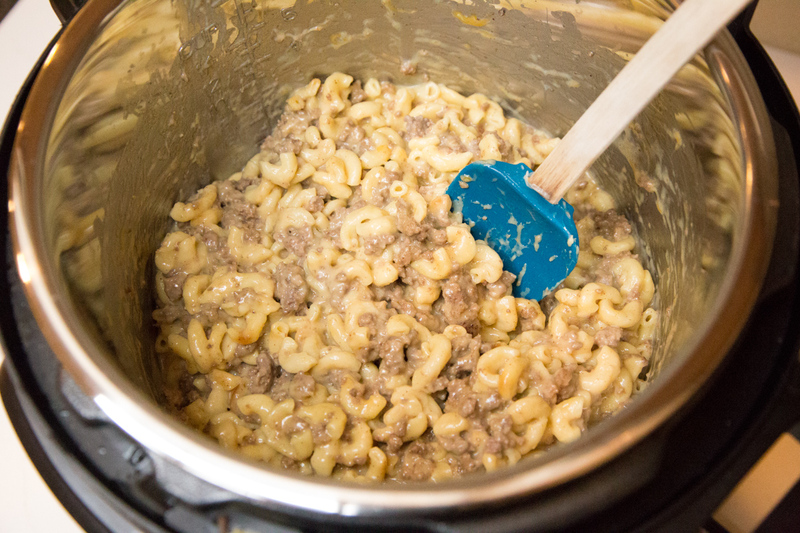 Brown the ground beef in a skillet, cook the pasta in the Instant Pot, mix in the cheeses and milk, then mix in the browned ground beef. Use pre-browned ground beef from the freezer, thaw it for a few minutes to get it out of the bag and add on top of the dry pasta and liquid. (See below!) You can add it still frozen on top, or you can thaw it completely and add it to the top of the pasta and liquid, or underneath the pasta and liquid. Above you see option #3. And this is option #3, just after opening the lid. The meat is all thawed, the pasta is cooked and it’s ready to be mixed together. Gently combine the cooked pasta and beef. Then add the butter and milk. And stir it all through. From here you can add different spices – Italian seasoning or Cajun seasoning or taco seasoning or Ranch dressing mix. Whatever works for your family! 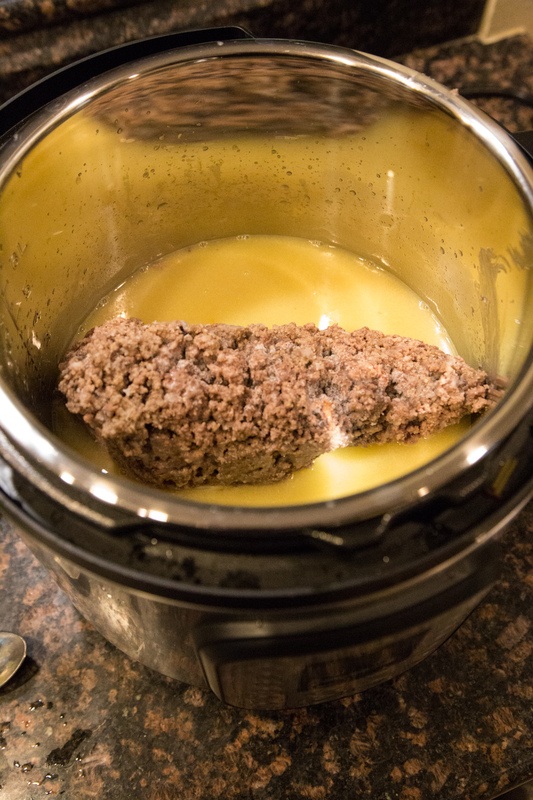 Add the ground beef, minced onion and garlic powder to the base of the Instant Pot insert. Press Saute and Adjust to More, and brown the ground beef. Drain, if needed, and add back to the insert. Add the dry pasta onto the browned ground beef. Set on Manual, High, and cook for 6 minutes. Let naturally release for 5 minutes, then release the remaining pressure. Stir the pasta and ground beef and mix it up well. 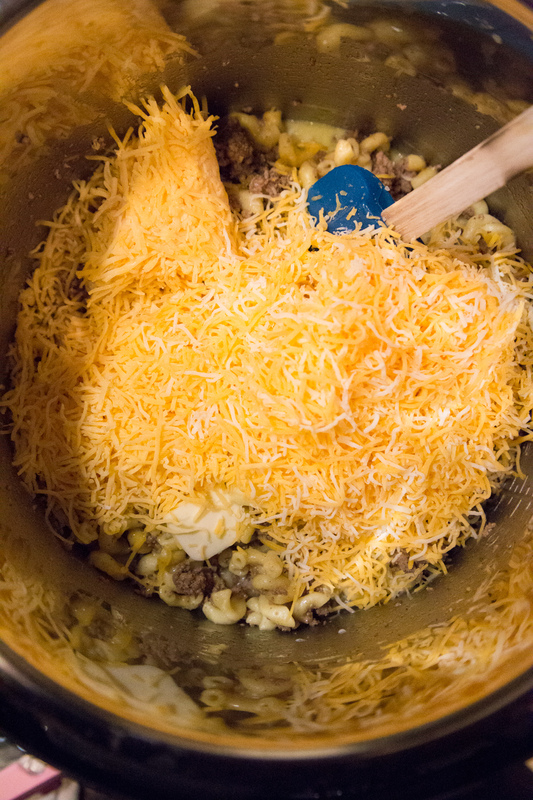 Then add the butter, cream and shredded cheese. Stir to combine. Season if you wish, with one of these options: Italian seasoning, Cajun seasoning, taco seasoning, Ranch dressing mix. Serve Instant Pot Hamburger Helper with favorite veggies or salad. Tried this tonight – big hit with my teens! Followed exactly, and added 1 Tbsp Italian seasoning. This was a BIG hit with use. Served 3 for dinner & made 5 leftover lunch servings! Win, win! 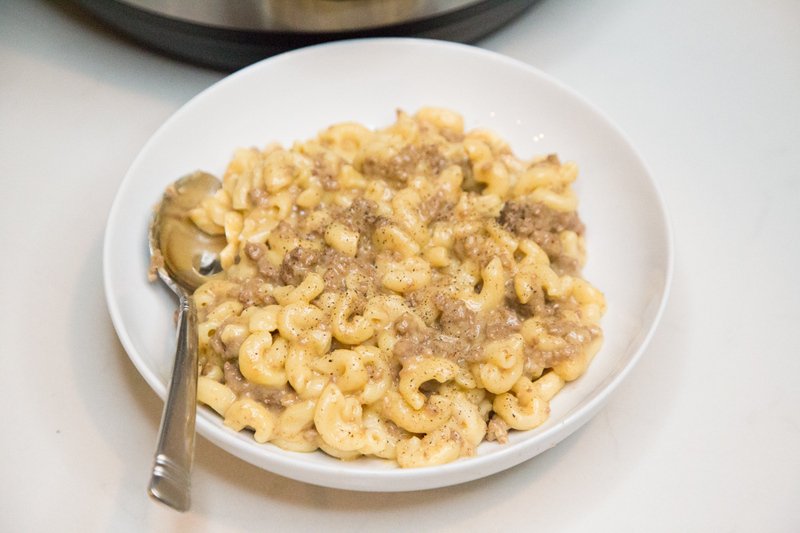 For Cheeseburger Macaroni Hamburger Helper, the key ingredient is Paprika instead of Mustard. You could probably mix the two ingredients together, but definitely add regular paprika.